Over the years The Hall Design Group has designed and installed several custom wood burning pizza ovens into the home. Thanks to General Electric there is no need to do that anymore. General Electric has introduced a unique pizza oven within their Monogram line. This oven will fit right into your cabinetry just as a 30” wall oven would. The oven burns up to 1300 degrees and the “LCD controls allow for easy selection of pre-set cooking options including a variety of pizza settings and choices for flatbreads”. Another nice feature to this oven is the integrated oven vent which means no venting out of the home. 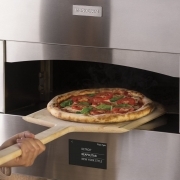 The performance of the oven allows for a crispy pizza just as one would find coming out of the wood burning oven. Pizza anyone?